Rick Sternbach recently posted these images on his Facebook page - models that are planned for future release in the Eaglemoss official Trek Ships line. The aztecking is a bit cloudy but, on the whole, these are REALLY nice looking ships. And, for the first time, the REAL Nebula-class Melbourne! No word on the Niagara or Freedom classes yet, though, although I think I remember that the various Excelsior models that had shown up in the background shots might be considered. Can't remember where, though. We finally get to see what the area with the 2 rear engines on the Melbourne looks like, potentially ending years of speculation! I'm now wondering if that coffin-box-like thing that they were mounted on was eventually lifted up to be made to look like a smaller sensor pod on the Sisko desk model, after the engines had been removed. Looks like that could be the case. 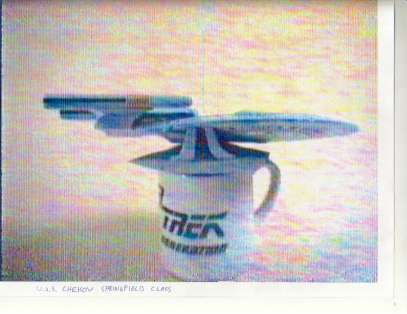 It also appears to be the exact same kind of object that's sitting on the Springfield-class USS Chekov. Thoughts? Enjoy - these things are awesome! Thank you for the post. These are amazing! Never knew the Springfield had a split at the front of the pod. Awesome. Just the other day I was doing a Google search on "U.S.S. Melbourne" to see if Propworx had found the original model along with the Buran. And now we have the pre-damaged version! Yay! So both pods from the Melbourne and the Chekov were pieces added later by Okuda, and not originally constructed by Miarecki. Okuda says they were cockpits from a Robotix toy set. 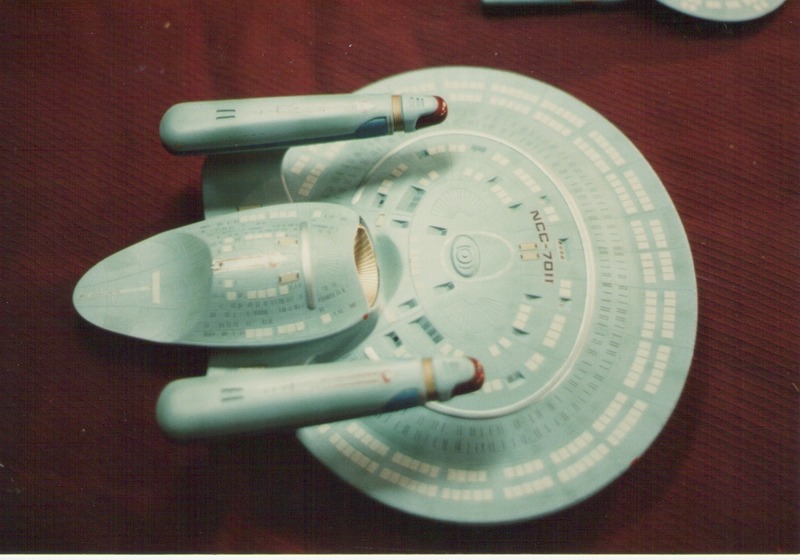 That probably also means that the smaller nacelles on both Melbourne models were also Okuda additions, the only difference being that the desktop version had the nacelles but not the pod. So Miarecki's original version had nothing where the now-obligatory weapons pod went on the filming model. I'm now wondering if that coffin-box-like thing that they were mounted on was eventually lifted up to be made to look like a smaller sensor pod on the Sisko desk model, after the engines had been removed. 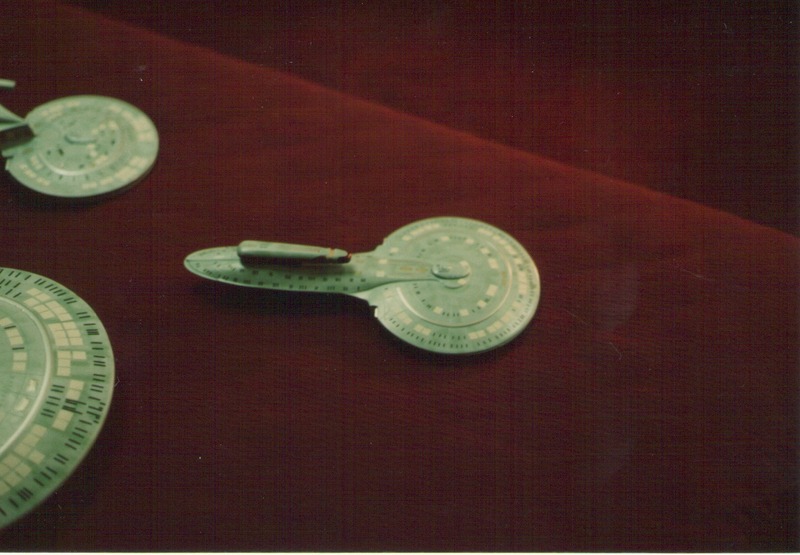 No, because the desktop model in Sisko's office still had the two nacelles, just with a tiny connecting piece added on between them. I always guessed that the Melbourne's small nacelles were on a separate piece stuck to the back of the saucer, and not at the end of the secondary hull. Turns out I was right, lol. Also, it looks like the Kyushu's bridge model was a custom-built piece, not the actual part from the 1/1400 model kit. Tried doing an image search on Robotix toys and I didn't find anything that came close yet. It does look like a hinged canopy of some type, but all the ones I've found are clear, rounded and smooth with no additional detailing on them. I suppose they could have added the greebles and painted it over, but I found nothing yet that matches the base shape. Will keep looking. Drat, you're right! Was really hoping that we finally got the answer to that one - it's been hounding me for years. Would still love to know what that little bit is. I honestly wonder why they felt the need to add that, unless the engines kept falling off during filming and they glued that on to give extra support. Kind of like the trapezoidal-shaped piece of wood in the TOS Enterprise corridor holding up that valve thing on the wall that kept falling down. You're talking about this one, yes? I dunno - it looks just like the 1/1400 bridge sitting on top of the 1/2500 hull to me. Why custom build something that was already readily available? Okuda said that he added the detailing to the pod himself. So it was probably just a smooth cockpit originally. The front pronged piece looks like a computer keyboard foot that was added on. Would still love to know what that little bit is. I honestly wonder why they felt the need to add that, unless the engines kept falling off during filming and they glued that on to give extra support. You're talking about this one, yes? Looks just like the 1/1400 bridge to me. Why custom build something that was already readily available? If you look at the Kyushu dorsal pic, you can see that the bridge detailing is completely different than the 1/1400 bridge module pieces from the Buran, Chekov, and Ahwahnee. At one point this was the reason why I thought the Kyushu was actually made from a 1/1400 kit. Does it look like the Kyushu is larger than the Chekov? Y'know, now that you mention it (and I'm assuming you're basing this on the comparative scale of the coffee mug in relation to the model sitting on it) it does appear to be much bigger, especially since everyone's been saying that these photos are all supposed to be of the upcoming Eaglemoss models, which should be at least half the size of the originals. Based on these photos, that cannot possibly be true. Maybe this is why the bridge module looks different than the 1:1400. Maybe it's a 1:2500 bridge on a yet-smaller model, like a Johnny Lighting or Hot Wheels E-D? That would explain the even more drastic change in scale. Or am I going in the wrong direction with that one? Maybe some off-scale resin kit bashes? I'm really confused. ^These photos are of the actual models used for BoBW. They're not the Eaglemoss models. The pic of the Chekov and these new pics were taken at the same time, since they're pre-damage. AH! That makes sense then. Everyone that's been talking about these on other forums seemed to think these were prototypes or masters of the Eaglemoss models. "Rick and I were always trying to talk our producers into doing more starship models, instead of always recycling the Excelsior, Grissom, and Reliant miniatures. I commissioned Ed Miarecki to make a number of study models to show how Enterprise-D components could be used to create other Federation ships. One of those models eventually turned into the Nebula-class ship. And several of them found their way into the Wolf 359 graveyard." After closer examination of the Kyushu pix, I'm forced to rescind my belief stated in another thread that the model was made using 1/2500 parts like Buran, Chekov, & Ahwahnee, & instead agree with Dukhat that it was constructed from 1/1400 parts, as with Melbourne. The picture above with the original Miarecki small-engined Buran supports this as well, as you can see Kyushu's saucer bow in the foreground. Well, that's a ton of info that we never had before! Aside from finally putting to rest the size of the Kyushu model, we also now see the Buran in its original Miarecki configuration. I had a feeling that it originally had smaller nacelles, but they're in the same configuration sans submarine pylon. I actually think Okuda's modifications made it look better. It looks like Miarecki did originally paint his models, and Okuda/Sternbach added the names and registries later for BoBW. So it's possible that when the BoBW script called for three ships named Chekov, Kyushu, and Melbourne, Okuda just chose three models at random to represent those ships instead of having them specifically designed. It also looks like I was right in my speculation that Miarecki's original Melbourne had no pod at all. the Miarecki models, I actually did not see them in the thread and the Buran looks weird as does the setting. Are we sure they´re genuine and not some fan-work? They're genuine. David Hirsch was one of the writers of the now defunct Star Trek The Magazine. I'm sure he got those pics from some production person's photo archive. Plus, the window layout on the saucer to the left matches the Kyushu's perfectly.